I've found that Craigslist is the answer...even when I'm not sure what the question is. "Caviar decor on a scrambled eggs budget." Given that I live within reasonable driving distance of Chicago, Milwaukee and Madison and that I have two sons who attend college in southern Illinois, my search area is pretty rife with potential. Over the last month, I've made weekend trips to salvage yards and resale shops in my area to get an idea of what types of things they have and to discuss the list of things that I'm looking for with the owners of the various shops so that they can let me know if something on my list comes into their store. I've also had wonderful support from my network of vintage junk loving girlfriends who know what I'm looking for and are helping me "shop" while they're picking and stocking their stores and booths. Of course given my budget, I've also turned to Craigslist. I'll be sharing what I find (as well as tips and tricks for finding and purchasing items on Craigslist) in the coming months. 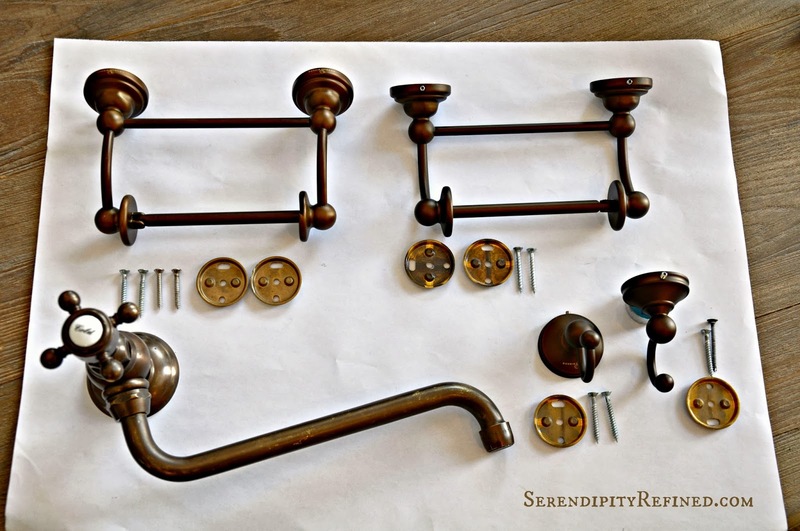 Today, I'm sharing the two bronze toilet tissue holders, two robe hooks and pot filler that I purchased last week for a total of $225.00. The original "asking price" was $325, but I made a package deal with the guy who was selling them. Know what you're looking for. I have a spreadsheet where I'm keeping track of what I need for the various rooms in our home. This helps me to remember what I have already purchased, what I still need and how much remains in my budget. Tell your friends who are in the "business" (vendors at flea markets, thrift store owners, contractors, plumbers, electricians) what you're looking for. They may be willing and able to assist. Understand what you're looking at. 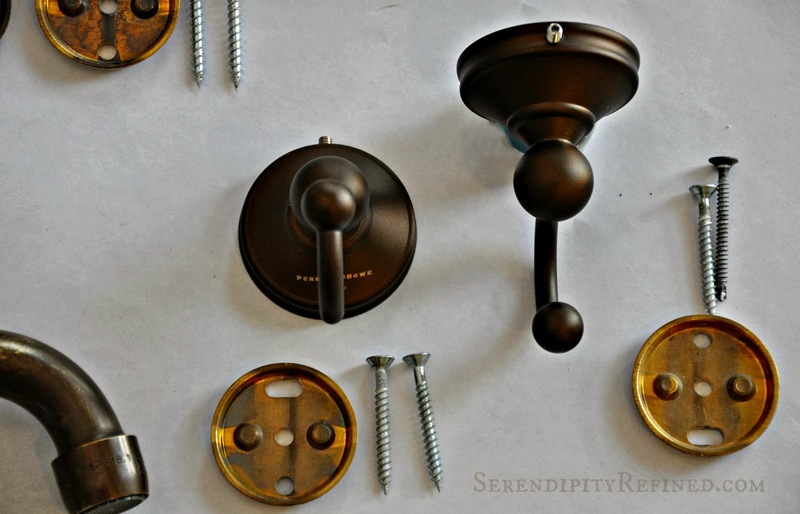 For example: Each of the robe hooks and the toilet tissue holders has a brass mounting plate which gets attached to the wall and to which the hooks and holders are attached via a set screw (the little screws in the bottoms of the pieces). Replacement set screws can be purchased from most hardware stores for a few cents. Replacement mounting plates, however would add incremental cost to the items so it's important to know that all of the necessary parts are included to avoid having to purchase parts in order to make items functional. The "pot filler" is attached to the wall above the cooktop at the end of the water supply line with a simple connector. These are readily available and are a part of normal plumbing supplies so it's not an issue that it's not included. When purchasing the pot filler, I checked the water filter, the threads on the part where the filler will be attached to the wall (to make sure that they weren't damaged or stripped) as well as the junctions where the spout swivels and the faucet knob turns on and off. All appear to be sound and didn't leak when I filled the faucet with water. 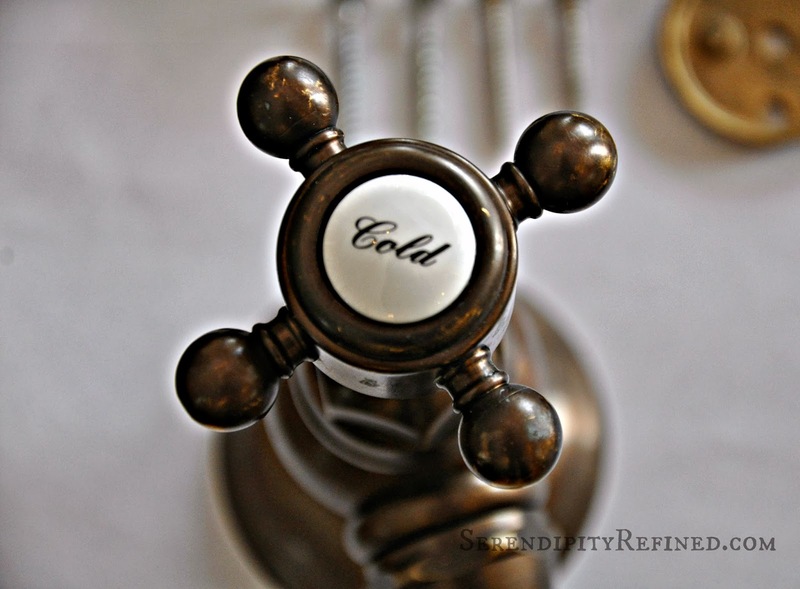 The robe hooks and toilet tissue holders are made by Perrin & Rowe and are solid brass construction. If purchased new, the robe hooks retail for $104 each and the toilet tissue holders retail for $304 each. The pot filler is made by Rohl. It's also solid brass and has a "Tuscan Brass" finish. It retails for $275. 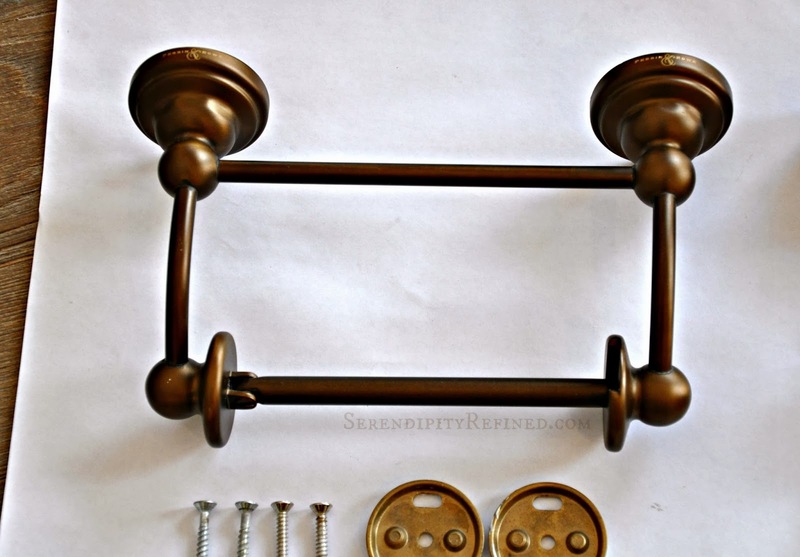 Sure, I could have probably purchased other tissue holders and robe hooks brand new for less than the $125 that I spent for those four items but they wouldn't have been solid brass and they wouldn't have kept metal out of the scrap yard. The pot filler was the item that sealed the deal for me. The finish is pre-aged and it's exactly what I would have chosen if I had to purchase it new. Always negotiate. Many sellers will offer better pricing if you purchase more than one item. Don't expect finishes to be "perfect". Most items have been installed and in use in some one's home. Have cash and get receipts for larger items. Know where you're going and who you're meeting and if you're unsure, bring a friend along. 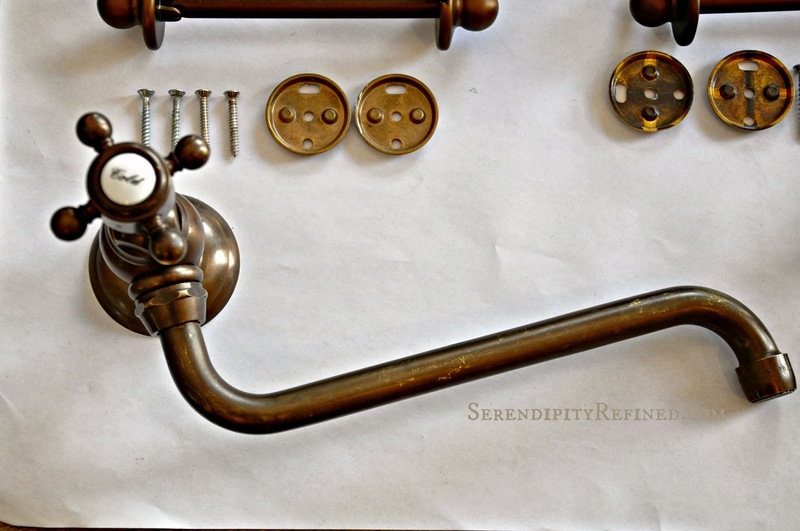 Purchased new (not on my budget), these bath accessories and pot filler would have cost $1,141. By using Craigslist, I saved $866. If you follow along on Facebook, you know that I've purchased a couple of big plumbing fixtures in the last few weeks as well. I'll be sharing posts soon.